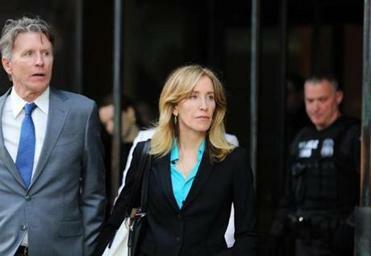 Felicity Huffman left the Boston federal courthouse last week. “My daughter knew absolutely nothing about my actions, and . . . I have betrayed her,” Huffman said in a statement. All of them signed plea agreements with prosecutors, who will seek prison sentences ranging from a few months to a few years, according to filings in federal court in Boston. Huffman, 56, was among 50 people, including celebrities, coaches, and high-powered financiers, charged last month with participating in the scheme, in which wealthy parents allegedly paid bribes up to $1.2 million to help their children get into some of the nation’s top colleges. “I am in full acceptance of my guilt, and with deep regret and shame over what I have done, I accept full responsibility for my actions,” the actress said. She is accused of paying $15,000 — significantly less than most of the other parents charged in the case — in 2017 to have someone proctor her daughter’s SAT exam and correct her answers afterward. A plea agreement filed in court Monday indicates federal prosecutors will argue she should serve between four and 10 months under sentencing guidelines. They will recommend she serve a term at “the low end” of that range. The guidelines are based on the amount of the bribe. Prosecutors will also seek a $20,000 fine and restitution. Huffman’s lawyers say the guideline range is zero to six months, according to the agreement. The judge is not bound by the guidelines and has the final say over the sentence. Huffman and her husband, actor William H. Macy, who is not charged, allegedly made the $15,000 payment to a charity run by admitted ringleader William “Rick” Singer, according to court filings. Singer allegedly arranged for an accomplice to proctor their daughter’s SAT in December 2017 and correct her answers so she scored 1420 — a 400 point increase over her PSAT score. “I am in full acceptance of my guilt, and with deep regret and shame over what I have done, I accept full responsibility for my actions and will accept the consequences that stem from those actions,” Huffman said. Other parents are continuing to fight the charges, including Lori Loughlin, a Hollywood actress best known for her roles on “Full House,” “Fuller House,” and “90210.” Huffman and Loughlin made their initial appearances at the John Joseph Moakley US Courthouse in the Seaport District last week, and both were released on bail. Parents who have agreed to plead guilty to conspiracy to commit mail fraud and honest services mail fraud include California real estate developer Bruce Isackson, 61, and his wife, Davina, 55. In addition, Bruce Isackson will also admit to one count of money laundering conspiracy and one count of conspiracy to defraud the IRS, officials said. The Isacksons, who have agreed to cooperate with the government’s ongoing investigation, said they let down their entire community. “We have worked cooperatively with the prosecutors and will continue to do so as we take full responsibility for our bad judgment,” the couple said. Other parents who have agreed to plead guilty include Jane Buckingham, 50, of Beverly Hills, Calif., an author and founder of the youth marketing consultancy Trendera; Devin Sloane, 53, of Los Angeles, founder of a provider of drinking and waste-water systems; Peter Sartorio, 53, of Menlo Park, Calif., a packaged food entrepreneur; real estate developer Robert Flaxman, 52, of Laguna Beach, Calif.; Napa vineyards owner Agustin Hunneus Jr., 53, of San Francisco; Marjorie Klapper, 50, of Menlo Park, Calif; and Stephen Semprevivo, 53, of Los Angeles. Michael Center, 54, of Austin, Texas, the former head coach of men’s tennis at the University of Texas Austin, has agreed to plead guilty to conspiracy to commit mail fraud and honest services fraud. He’s accused of helping the child of one of Singer’s clients get into the college by falsely designating the student as a tennis recruit. In exchange, he allegedly accepted a $60,000 cash payment for himself and a $40,000 donation to the university’s tennis program. In some instances, parents allegedly paid Singer to have someone else take their children’s SAT or ACT exams or correct their answers afterward. In other cases, parents are accused of paying Singer to bribe coaches to designate their children as athletic recruits for sports they didn’t play — guaranteeing them admission to colleges that included Georgetown, Yale, the University of Southern California, and the University of San Diego. Singer began cooperating with federal authorities in September and secretly recorded conversations with some of the parents. He admitted he rigged a system in which parents paid bribes to his company disguised as charitable donations. Documents filed in court indicate some of the children were unaware of the cheating schemes, while others were allegedly active participants. Stanford University has expelled a student who was connected to the bribery scandal. University officials did not identify the student but said she was among three students being reviewed as part of the scandal. Shelley Murphy can be reached at shmurphy@globe.com. Follow her on Twitter @shelleymurph.